Laser sights are a popular tool for sport shooters and hunters looking to increase their accuracy. Not only do they allow higher accuracy, even in low light conditions, but they are also a great learning tool for moving target practice. Just like the gun and ammunition it will be used with, a laser sight needs to be used and chosen responsibly. To help you track the best suited one for you, we have put together a full buying guide, providing all the information you need to buy a laser sight that is right on target for your needs. 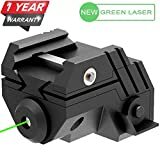 Green Laser Sights: These high-end laser sights offer brighter target points that are easily seen in the dark as well as bright sun-lit conditions. With a laser reach of 100 yards, green laser laser sights make it possible to target further distances, and are a great choice for outdoor use. Red Laser Sights: Laser sights with red lasers are easy to build and require a lot less power to run. Ideal for close ranges in mid to low light conditions, they are the prefered choice for defensive situations. Red lasers operate well in a wide temperature range, stand up to recoil well, and offer good value for money. 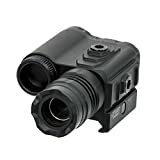 IR Laser Sights: Working in conjunction with night vision, laser sights with IR lasers are the top choice for law enforcement. Intended only for professional security users, it is advised to check that they are legal for purchase and use in your state. Constant Light Sights: Laser sights offering a constant light pattern are ideal for close quarters and ranges as they provide a steady targeting point that continuously shines on your target. 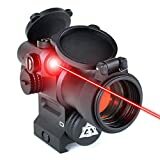 Pulsing Light Laser Sights: Laser sights offering pulsing light patterns are ideal for bigger distances as the targeting light flickers or pulsates which is easier to spot. The flickering also gives targeters better visibility on a variety of backgrounds and conserves battery well. Grip Laser Sights: Individually designed for specific handgun models, these laser sights attach to or in place of the grip of the gun. These will have a switch at the back of the grip where you are able to activate the laser, often simply by holding the gun in your normal firing position. Rear Laser Sights: These lightweight laser sights are easy to attach as they mount to the rear sight of your handgun. The way they attach does not affect how the gun fits in your holster, making it a convenient choice. Trigger Guard Mounted Laser Sights: As the name suggests, these lasers are mounted to your gun’s trigger guard. Their larger build allows for a much more powerful targeting laser for better vision. Internal Guide Rod Laser Sights: Having the benefit of working with your current handgun size, they are mounted by replacing the internal guide rod. Rail-mounted Laser Sights: These laser sights are mounted to your handgun by a rail. If your handgun already has a mounting rail this is a very convenient option. 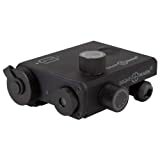 Rifle Mounted Laser Sights: These laser sights are designed to be mounted either to the barrel or to on the top of your rifle body, and offer a lot more power than handgun sights thanks to their increased size. They're great for the training marksman or home hobbyist who wants a convenient way to improve their accuracy. Brightness: Laser sights with brighter beams make the targeting spot easier to see and are rated much higher. It is important to note that battery life can also affect the strength of your beam, and as the power level drops your spot may dim. For the best satisfaction with your purchase, look for both a strong beam as well as a long battery life. Mounting build: Laser sights are constantly reviewed on not only the quality of the mounting build but how it handles during operation. 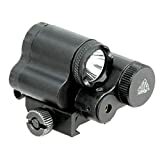 Laser sights that provide solid mounting with easy adjustment that doesn’t move during shots are found to be more accurate and therefore rated higher. To ensure this, look for a model brand with a good reputation, like the top reviewed brands, and check mounting build and screw reviews. Control: Laser sights that do not have well positioned activation controls that are easy to use and sensitive to touch are not rated well by consumers. Ambidextrous controls are definitely a favorite, offering up much more control. Size: Laser sights that are lightweight and unobstructive are more popular as they don’t affect the holding weight or handling significantly. For added comfort, look for a lightweight laser sight that fits into normal sized holsters and doesn’t dramatically change the appearance of your gun. The most important consideration when choosing a laser sight is to make sure it is compatible with your current rifle or gun. Rear laser sights, for example, are designed for only a handful of handgun models. Ensuring compatibility will prevent unnecessary upgrades and moderations. Laser sights have one of two types of switches. You can either turn it on/off manually, or it may be automatically activated by pressure. The former is a good option for shooters who want complete control over their laser, while the latter is great for those who want laser accuracy without any extra steps. Automatic lasers tend to be a feature of grip mounted laser sights, with the laser turning on automatically when the gun is in a position to fire. The battery life of laser sights range anywhere from 4 to 48 hours, and is an important consideration when choosing a sight for your gun. Some lasers light patterns will require more power than others, and battery life will differ from model to model. Comparing product specs of top brands to learn battery life will help ensure you get the battery longevity you desire. Waterproof laser sights are recommended for shooters who will be active in rainy and humid areas. Light/laser combos will save you space, make your gear lighter, and will be a lot easier on your pocket versus buying the two separately. They typically include flashlights with a variety of features, are made for both rifle and handguns, and are well worth considering. Temperature ranges of green laser sights will differ from model to model, so checking the manufacturer specs of each to compare will help you choose the one with the right range for you. Grip laser sights are available with a master override on/off switch. This is a great battery saving feature which will only turn the laser on when you need it. It is important to note that your laser sight will not be as durable as the handgun or rifle you have mounted it on. This will mean a little extra care is advised once the sight is mounted. A final note on safety is that laser sights should not be taken lightly. The beam can cause permanent eye damaged if focused on someone’s eye (or your own) and your laser will have to be safely stored with your gun and ammunition to make sure it isn’t used by anyone other than yourself. Crimson Trace: Crimson Trace Corporation started in 1994, and continues to design and manufacture all of its products in Wilsonville, OR. They specialize in designing and manufacturing just firearm lasers, and have shipped over 2 million lasers over the last 20 years. Streamlight: Eagleville, PA based Streamlight is a manufacturer of a wide variety of flashlight products. Since 1973 they have produced products for both civilian and governmental uses. Their combination flashlight/laser products provide excellent versatility in a wide range of situations. Barska: Barska is located in Pomona, CA, and makes precision sport optics, ranging ranging from binoculars, riflescopes and spotting scopes, to telescopes. They tailor their scope designs specifically to the needs of hunters. LaserLyte: LaserLyte, run by father and son Larry and Aaron Moore, is the shooting and hunting division of P&L Industries, Incorporated. In addition to laser sites, the company also offers an array of laser training products to improve accuracy without using costly ammunition.